Clothing and linens in good condition can often be donated — find local donation locations. Drop off clothing that is torn, stained or worn out at thrift shops. Most large thrift shops recycle clothing that they can’t sell. Some major clothing recyclers include Goodwill, The Salvation Army, Society of St. Vincent de Paul, Savers, Blue Jeans Go Green, American Textile Recycling Service and USAgain. Mail in your denim to the “Blue Jeans Go Green” Campaign for free. They recycle it into UltraTouch Natural Fiber Insulation, which will be used in homes across the country. Find out more. Mail in new or gently used bras to The Bra Recyclers. The Bra Recyclers is a textile recycling company working to support and educate communities worldwide. Find out more. Many popular retailers, including Forever 21, H&M, Levi’s and The North Face, accept old clothing through a partnership with the recycling company I:CO. Donated clothing is resold, repurposed, or recycled back into raw materials. You can find lightly worn or even brand-new clothing at consignment or thrift shops. Help reduce your carbon footprint and reuse what’s in circulation. Consider reselling lightly worn clothes to a secondhand for-profit shops, like Buffalo Exchange, Plato’s Closet, Clothes Mentor or Once Upon a Child. These stores look for clothes from popular brands. Try going online to swap and/or sell old threads. Here is a list of those sites: eBay, thredUP, swap.com, Poshmark and Tradesy. 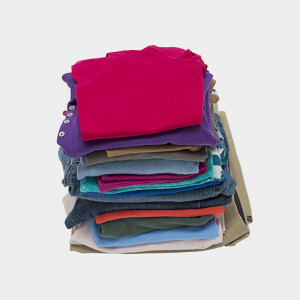 Get rid of children’s clothing by giving them to friends or neighbors as a gift for their children. Children quickly outgrow their clothes, so hand-me-downs are practically brand-new. Consider donating clothing that might be too difficult to sell in order to keep it out of landfills. You can donate unwanted clothes to any of these nonprofits: Goodwill, The Salvation Army, Society of St. Vincent de Paul, Vietnam Veterans of America and PlanetAid. Every time you wash synthetic clothing, tiny fibers from the fabric — microplastics — are swept down the drain and into our water system. A 2015 study found plastic debris from textiles in 67 percent of fish species sampled, including many species consumed by humans. In response, this company is developing a microfiber catcher that you toss in your washing machine to prevent the fibers from polluting our waterways. The Renewal Workshop is a company that repairs imperfect clothing and sells it at a discount so that it won’t end up in a landfill. They have partnered with clothing manufacturers such as prAna, Ibex and Toad&Co. Learn more about their work toward building sustainable clothing systems here.